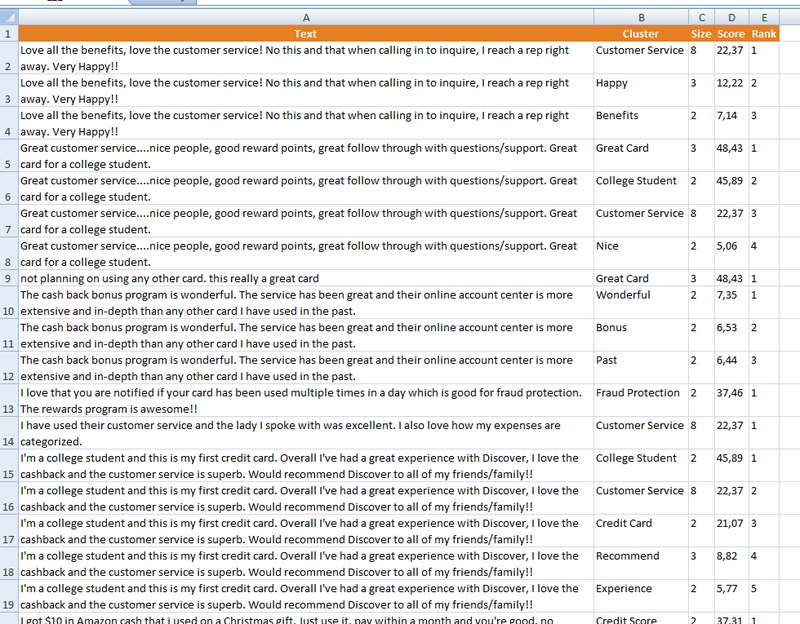 The Text Clustering analysis integrates the functionality provided by the Text Clustering API. It allows automatic clustering of documents in order to group them by similarity and discover significant subjects. You can see that there are two areas in the interface: Input, which we have already covered in the corresponding section, and Analysis Settings. Language, to select the language of the texts. Mode, to select the mode to use in the clustering process. Stopwords, to add terms that are not to be taken into account in the clustering process. To add a new stopword you just need to click on the button "Add" and write the new word. To remove a stopword, select it on the list and click on the button "Remove". The list will be saved from one analysis to the next. Cluster: displays the title assigned to the cluster. This field is not configurable, so it's always shown. Size: shows the size of the cluster. Rank: shows the order by relevance of the cluster for the document. Score: shows the relevance value assigned to the cluster. There's more information about each one of these fields in the response section of the API documentation. The results obtained from the analysis will be shown in a new Excel sheet called "Text Clustering". 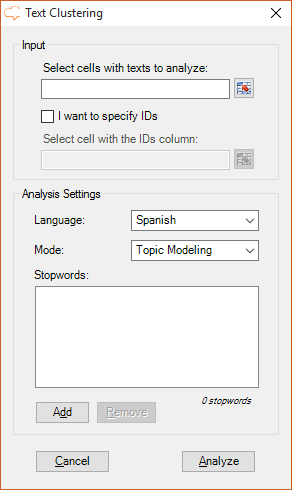 This sheet will include a column with the source text, a column with the IDs if enabled, and then a column for each of the output fields configured in the advanced settings. 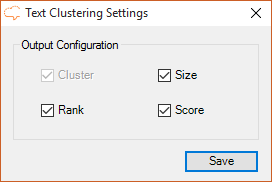 When the document is included in more than one cluster, each additional cluster will be inserted as a new row. The original text and the ID will be behave as specify in the "Combine cells in the output" option in the Settings section.